"Adding strength training has been a real game changer for me. I’ve been amazed at the changes I’ve seen all while having fun with other women working towards their goals." - A.R. "Nice sore abs, obliques and inner thighs today. I love it!! Great workout..I loved it!" - T.K.
" I really do love training with you!" - K.B. “Kim knows how to relate to the client. She readjusts the workout according to my weaknesses & what I want. She will keep you moving when resting certain muscles, which makes a more effective workout. She’s very knowledgeable which is what I need. I have had bilateral knee replacements, bilateral rotator cuff surgeries & a recent hip replacement. She has shown me a better way to exercise so that I can continue to move.” - K. H.
"Well, I have to say finding the right exercise program for oneself can be hard, VERY hard. Going it alone never worked for me. Even group classes ( exercise, yoga, water aerobics) at the community center--meh. One and done. For years. But this. This place. Weight training and tread with these awesome instructors and classmates-- holy cow! Heaven sent! I remember when I left my first meeting with Kim last summer, I texted Anna-- if I can't stick with this I'm a lost cause. Ha! Here I am one year later. Yay, me!" - J.T. "Despite being in a boot for a stress fracture of my my foot, I did a person best of 120 pounds on this exercise (lat pull downs). Thanks to Kim for teaching me to work around and with my limitations because it has been a life changing lesson." - J.B.
"SO my boss (female) said to me today. You look great. Have u lost weight? Can you say "motivation"? To keep going? Thanks Kim!" ~ J.T. "Love this idea and I love you ladies!!! Most importantly... I love how you have made me feel in just the two times I have worked out with you!!! My new year/new me has already started!!! Thank you all so very much!!!" - B.S. "Thank you Kim for teaching my how to workout while dealing with autoimmune arthritis. Wrapping up month 5 of constantly working out. I couldn't run yesterday because of a flair up, so I rested and did it today. Feelings amazing to be accomplishing so many workout goals. Thank you for helping me to change my life!" - J.B.
“I went on a 3 hour kayak tour and wasn't even sore! It was awesome. I don't think I could have said that a couple months ago.” - S.W. “So I just came out of a dr appt. Since I started working out with you my weight is down significantly as is my blood pressure. My BP has never been high, it was 124/85 last visit. But it freaked me out because it was high for me. Today it was 117/70. My dr asked what I'd been doing. I said "exercising". Thank you for being such a wonderful motivator and friend. I hope I can make this kind of difference in someone's life.” - K.L. “I just wanted to thank you and tell you that it was nice to meet you yesterday. I am a little sore today but really looking forward to getting started on my journey! The best part is my son was so proud of me!!! Thank you for your time, I look forward to seeing you next week.” - S.W. 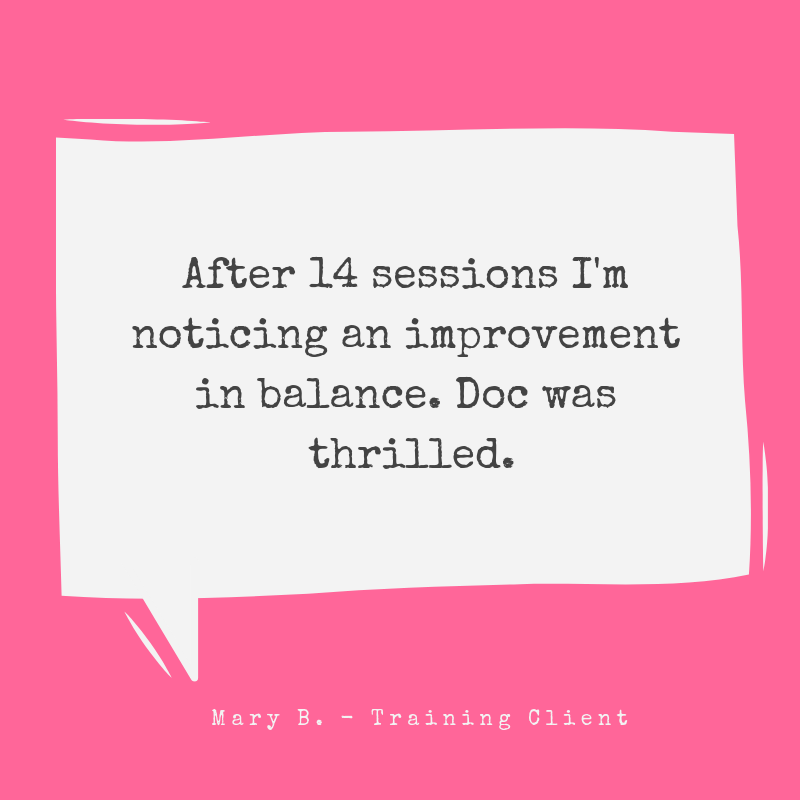 “I just completed a series with Kim - awesome, individualized, small-group strength training!” - J.B.
“Definitely felt the lifting in my shoulders and top part of my back. Definitely like mixing it up the routine and seemed like an all over workout with the lifting and floor exercises together. I was surprised at my pulse getting up to 154.”- P.H. “I think I hate you. My arms were so pathetic last night I could not reach my wine. Just reaching off the couch to pick it up was dangerous.This morning I hurt from my where my neck meets my shoulders down my arms to the elbows (not including the elbows) and down my back ribs. Like I'm wearing fairy wings made of bricks. That's the mental image I've had all day. And I blame you. And my sides ache from the teapots. But I slept like a baby. See you Monday for more.” - K.M. "4 sets of 8 :) I could not do one of these bench rows at this weight when I first started. It amazes me how far I have come. Thank you, Kim" - J.B.
“Kim is an excellent trainer! She is extremely knowledgable and very motivating! Kim always has a positive, encouraging attitude! 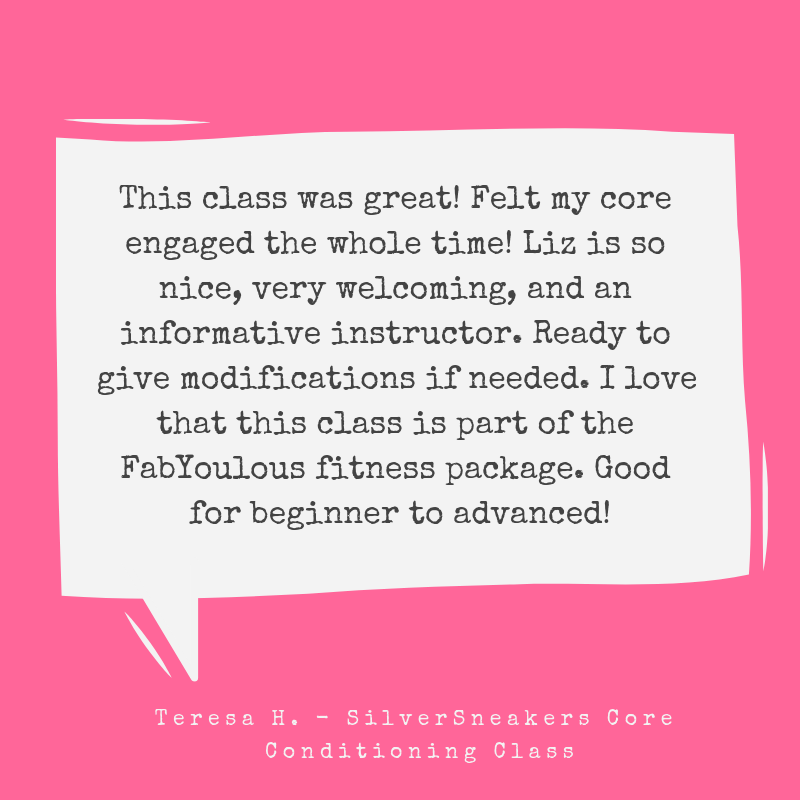 If you want a great workout, I would highly recommend her!” - M.G. 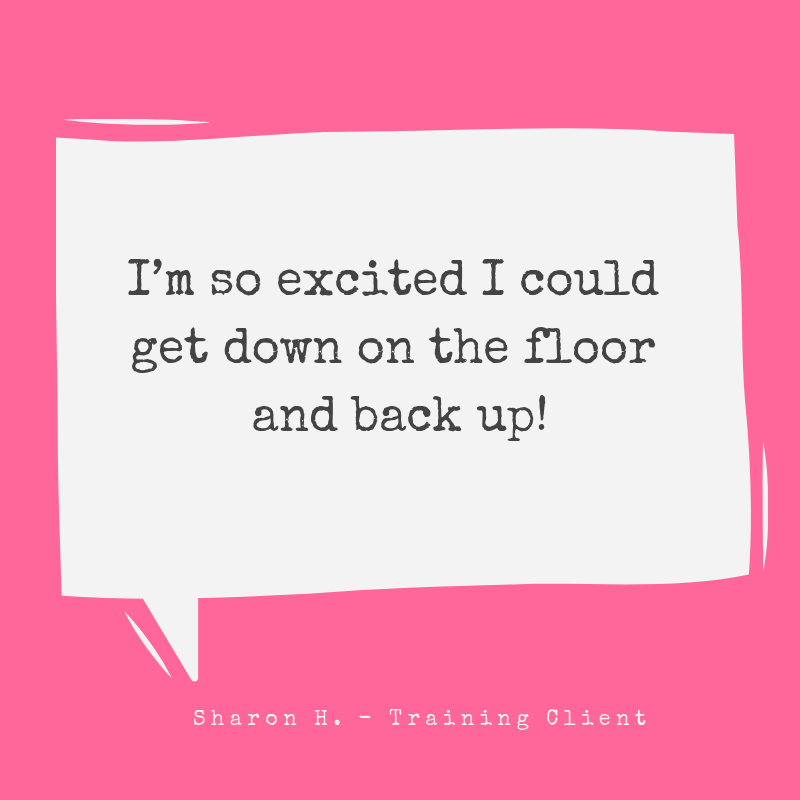 “Kim is a fantastic trainer! She does a great job of creating challenging workouts while being mindful of individual's abilities. She is very encouraging and down to earth...she makes everyone she trains feel at ease. I highly recommend working out with Kim!” - M.L. “I work out with Kim 2x a week. We work on strength training primarily. She has also advised me on using my heart rate monitor during cardio. Working with Kim is great. She is educational and encouraging. No yelling. No nagging. Just working with a caring professional who guides me through exercise. Exactly what I wanted! Kim keeps in touch regularly via text, email and FB. Scheduling is easy and payment is simple.” - K.M.